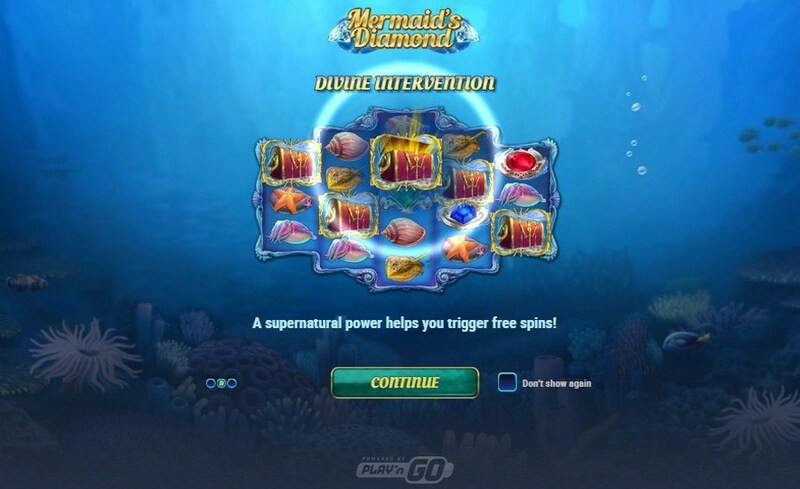 Mermaid's Diamond is a new startling video slot game by casino games provider Play'N Go. There are eight regular slots symbols in Mermaid's Diamond. The low limit payers are the aquatic creatures: the conch pays a lowly 0.1x-0.5x for 3-5 matching symbols of slot, as does the cuttlefish. The starfish and ray score a little better with a top payout of 0.75x your total stake per spin. The four high limit icons are represented by the jewels. The emerald pays a top 1x jackpot, the blue sapphire 1.5x and the ruby 2.5x. The cut diamond pays 10x if you line up five symbols on adjacent reels. Look out for the beautiful mermaid who looks like she's gone overboard with the pink hair dye. She's Wild and will substitute for all regular symbols in the game (other than the Scatter symbol). There's an additional Wild symbol to look out for when you play this online slot. A "mystical force" can randomly strike the reels and add extra Wilds to your columns. Watch out too for the Treasure Chest Scatter symbols. 5 of these landing anywhere will trigger the free spins bonus. However, if you only hit four Scatters, 'Divine Intervention' can help complete the set with a fifth Scatter. First, pick one of the chests to reveal your spins total (1-25). The feature can be extended by landing 3 or more Scatter symbols anywhere. 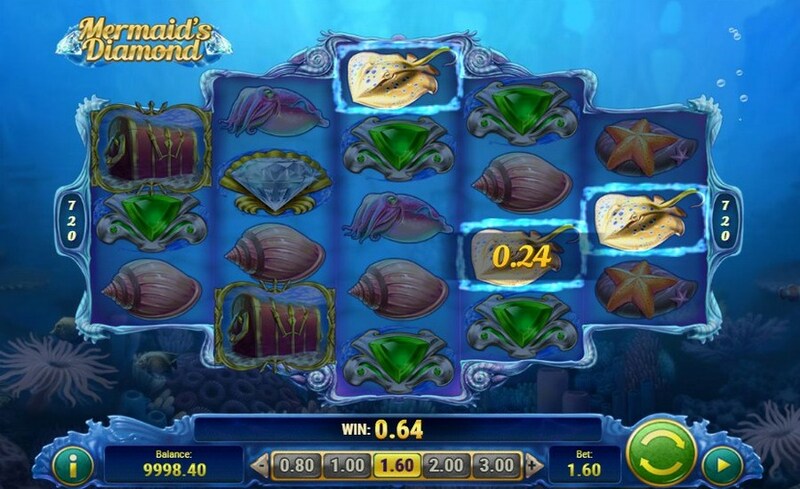 The Trident Wilds add the biggest bonuses to your bankroll, along with the Mermaid Wild symbol who can appear stacked on reels. During the free spins bonus game, you may land diamond symbols. If you do, they are "collected" above the reels. Fill up the meter with 5 diamonds and a reel will fill with Wild symbols. It's possible, so the game boasts, to win up to 5000x your total bet during the online casino bonus game. 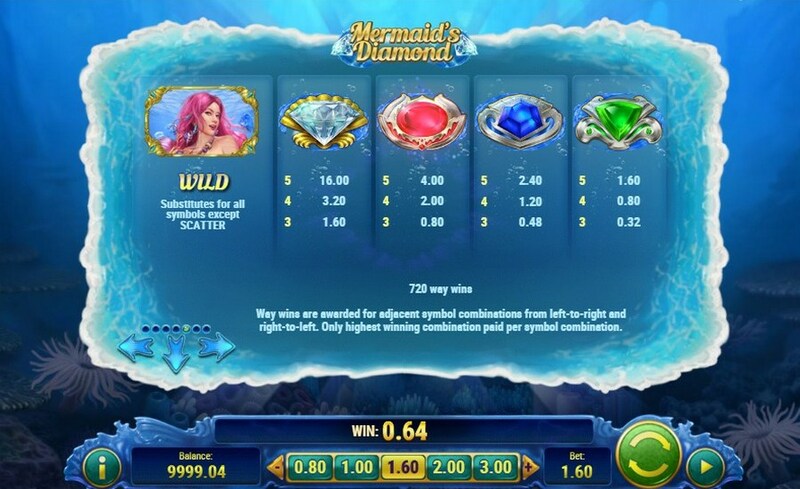 Mermaid's Diamond is a fun little online slots game with the potential for big wins.